Child and adolescent psychology master's programs give students advanced, in-demand academic credentials that can lead directly to rewarding careers. Though the Bureau of Labor Statistics (BLS) notes that candidates need a Ph.D. and a license to become full-fledged child psychologists, the agency also reports that a master's in child and adolescent psychology fulfills the educational requirements for some positions. The BLS projects that one such career, school and career counseling, will experience 13% growth by 2026. Overall, the BLS projects that demand for psychologists will rise 14% over that same period, making now an ideal time to enter the field. What Else Can I Expect From an Online Master's in Child and Adolescent Psychology Program? 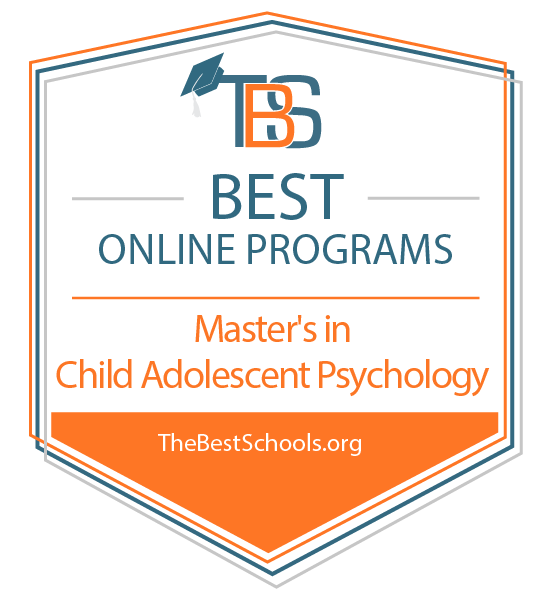 Online Master's in Child and Adolescent Psychology Degree Program Ranking Guidelines: We selected the degree programs based on the quality of program and range of courses provided, as well as school awards, rankings, and reputation. The University South Florida, a public, non-profit university, offers an online master of science in child and adolescent behavioral health degree program for professionals seeking to positively impact the live of children as they grow and enter adulthood. The program comes with four concentration options, in developmental disabilities, leadership in child and adolescent behavioral health, research and evaluation, and youth and behavioral health, providing plenty of flexibility for specialization. The program also offers two track options, culminating in a thesis, or an applied field experience. The online MS degree program requires 39 credit hours for completion, blending theory and discussion in courses with in-depth research and hands-on learning. Students develop advanced knowledge and skills in key areas, including child and adolescent behavioral health, policy and legislation in the context of the field, and evaluation and research methods. Students may complete the program in two years of study. The University South Florida is regionally accredited by the Southern Association of Colleges and Schools Commission on Colleges (SACSCOC). Liberty University, a private, non-profit, Christian university, offers an online master of arts in applied psychology degree program, with a specialization in developmental psychology. The program explores aspects of development of the human mind and personality over the lifespan, starting from its earliest stages. Students engage in a practice-focused approach to the study, learning about key concepts and how to apply them, including child psychology, adolescent psychology, developmental psychopathology, and the psychology of learning. The online MA degree program requires 36 credit hours for completion, and can be finished in less than two years. The courses take eight weeks each. As with other Liberty University programs, the program integrates a Christian worldview. The MA in psychology from The Chicago School offers a concentration in child and adolescent practice through which students foster a deep understanding of the complex variables that impact a child’s well being. In this flexible program designed for professionals, students can choose to enroll part or full time and complete the required 36 credits from the comfort of home. The Chicago School’s program is also a rigorous one designed to challenge students, who choose an area of interest early on and complete an applied research project over the course of their program. Online learners interact with peers and faculty through video conferencing and SocialCourse, a virtual networking solution for building online learning communities. Smaller courses may require an occasional synchronous virtual residency, where students engage live for one or two hours to meet and discuss ideas. The Chicago School is regionally accredited by the WASC Senior College and University Commission (WSCUC). CUNY School of Professional Studies, a public, non-profit university and part of the CUNY system, offers an online master of arts in psychology degree program with a specialization in developmental psychology. The program prepares students for advanced careers in psychology, examining human development and behavior from infancy to adulthood. Students develop key knowledge and skills in core and specialized areas, including learning and cognition, biology and behavior, social behavior, theories of personality, psychopathology, and behavior development. The online MA degree program requires 36 credit hours for completion. Courses cover specialized topics, such as child and adolescent development, adult development, and contemporary perspectives of development in the field. Students must also complete a capstone project. Students emerge ready to pursue higher-level employment, or doctoral programs. Southern New Hampshire University offers an online MS in psychology with an emphasis in child and adolescent development, preparing students to apply their skills in research and analysis to work with children and adolescents. Courses like theory of personality and social psychology also prepare graduates to apply analysis and work effectively with varied personalities. Students without a bachelor’s degree in psychology can still apply and complete foundational courses prior to beginning more advanced courses. Online students are also free to join SNHUconnect, an online student union where students can network with peers and faculty. SNHU’s graduate programs are designed to be completed in less than two years. Military service members and their spouses receive a 25% tuition discount on part- and full-time enrollment. The following schools are for-profit schools. If you have any questions about for-profit schools, check out our guide for understanding for-profit colleges and universities. Northcentral University, a private, for-profit university, offers an online master of science in child and adolescent psychology degree program for students seeking to advance careers in the field. The program examines developmental stages in childhood and adolescence, specifically in regards to how environment and experience affects growth into adulthood. Students explore key topics such as family and school, cognition, theories of development, child psychopathology, and disorders. The online MS degree program requires 30 credit hours for completion and consists of 10 courses. The program can be completed in 20 months, and with start dates every Monday offers plenty of convenience for students who are ready to begin their studies. Capella University, a private, for-profit university, offers and online master of science in psychology degree program with a specialization in child and adolescent development. Students prepare to advance careers as experts in the field of child and adolescent psychology through 11 courses and an integrative project. The program develops advanced knowledge and skills in key areas, such as child psychology, adolescent psychology, ethics, and lifespan development. The online MS degree program requires 55 quarter-credit hours for completion. Students may choose the traditional, GuidedPath model that utilizes a set schedule and deadlines, or the self-paced FlexPath model, which allows them to set their own schedule and complete the program as quickly as they wish. Child and adolescent psychology master's programs build on generalized, foundational knowledge from an undergraduate degree. At the graduate level, more intense and specialized coursework allows learners to develop advanced understanding of topics such as behavioral theory, research methods, treatment models, and ethical guidelines. Child and adolescent psychology courses focus on younger subjects, ranging from preschool-age children to adolescents and young adults. During their studies, students also develop professional skills for conducting behavioral assessments, strategizing interventions, and effectively communicating with young people. These courses equip students with the practical abilities they need to effectively work with children and adolescents in formal and clinical settings. You can choose either a master of science or a master of arts in applied child and adolescent psychology. Master of science degrees focus more on research methods and the biological aspects of psychology. They often lead to study opportunities at the Ph.D. level. Master of arts degrees take a more interdisciplinary approach, making them ideal for students who want to work in non-clinical settings such as schools or social work agencies. Although most professionals already consider child and adolescent psychology a specialized discipline, some programs allow students to focus on subfields like mental health management, autism spectrum disorders, divorce, or death. Students can also look for schools that offer electives in their area of interest. Online master's programs in child and adolescent psychology typically include a common set of core courses. These classes cover topics such as ethics, mental disorders, psychological research, and childhood development. However, exact details vary depending on the school. This course serves as an introduction to graduate child and adolescent psychology. Students apply theoretical models to real-world situations and case studies. In psychology, best practices constantly change as practitioners revise their methods to incorporate new research. This course highlights current areas of focus in the context of the field's ongoing growth and evolution. Research techniques, statistical methods, data analysis, and critical assessment all play a major role in a psychologist's professional duties. Courses in research methods help students build these important skills. Psychologists often grapple with difficult ethical decisions when designing research studies, forming therapy plans, and implementing intervention strategies. In ethics courses, students learn accepted principles for navigating such situations. Child and adolescent psychologists require advanced psychological assessment skills, regardless of the professional setting in which they work. These courses teach methods for assessing patients and creating accurate psychological profiles that inform therapy and treatment. Master's in child and adolescent psychology jobs focus on helping young people navigate difficult situations and cope with emotional challenges. While some jobs require further study at the doctoral level, others are open to qualified applicants with an MSc or MA in child and adolescent psychology. The information below features three popular professions for graduates, along with master's in child and adolescent psychology salary information. With a Ph.D. and a state license, candidates can open their own private practice. These professionals meet with patients, assess their situation, form therapy plans, and supervise their treatment and progress. School and career counselors help young people identify and discover their strengths and aptitudes, then use that data to find potential educational and professional options. Though child and adolescent psychology master's degree holders qualify for these careers, many states require additional licensure. Postsecondary teaching positions generally require a Ph.D. and several years of professional experience. After earning a master's degree, candidates may continue into a doctoral program, obtain licensure, and transition into teaching after accruing professional experience.